The recent articles about persons playing Taps every night as tribute to veterans got me thinking about bugle records. Has there been anyone who has played consistently for a period of time? And using a real bugle. 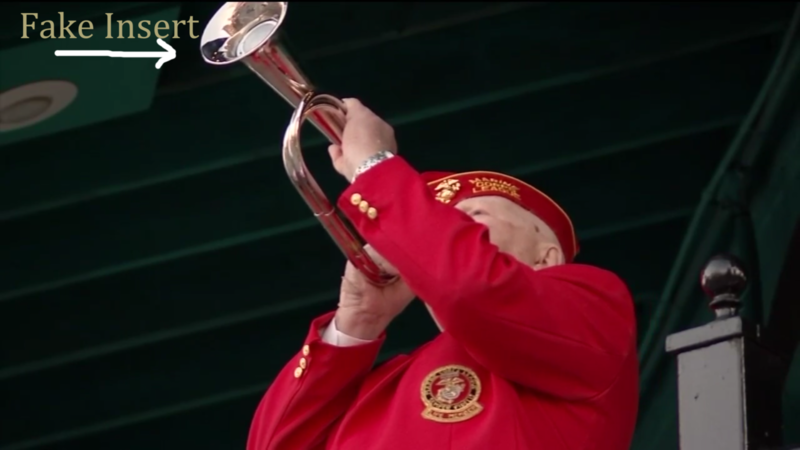 There are two who are featured as playing Taps every evening: one in Galveston, Texas and one in Indian Rocks Beach, Florida (you can look them up) using a digital bugle. And there is a naval lieutenant commander who plays Taps every evening on a sound system in Glen Rock Pennsylvania who has caused some consternation among his neighbors by playing it at 60 to 80 decibels every evening. The digital bugle is an instrument that uses a device placed inside the bell to play a recording of Taps. So basically one has to flip a switch, hold the fake bugle up and pretend to play. While it’s a nice gesture, most people who hear this are fooled into believing it’s the real deal-someone who is actually playing the bugle. Playing a real bugle takes some effort, some skill and dedication. Not just a push of a button. So I decided to check and see if there was anyone who held a record for playing the bugle for any long period of time. 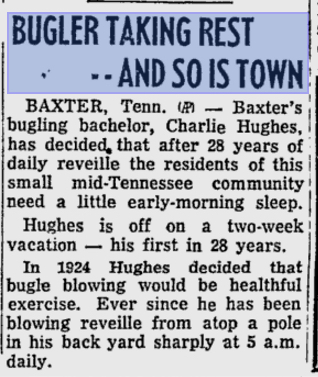 I discovered Charlie Hughes of Baxter Tennessee. Hughes lived from 1888-1970 in his hometown of Baxter. 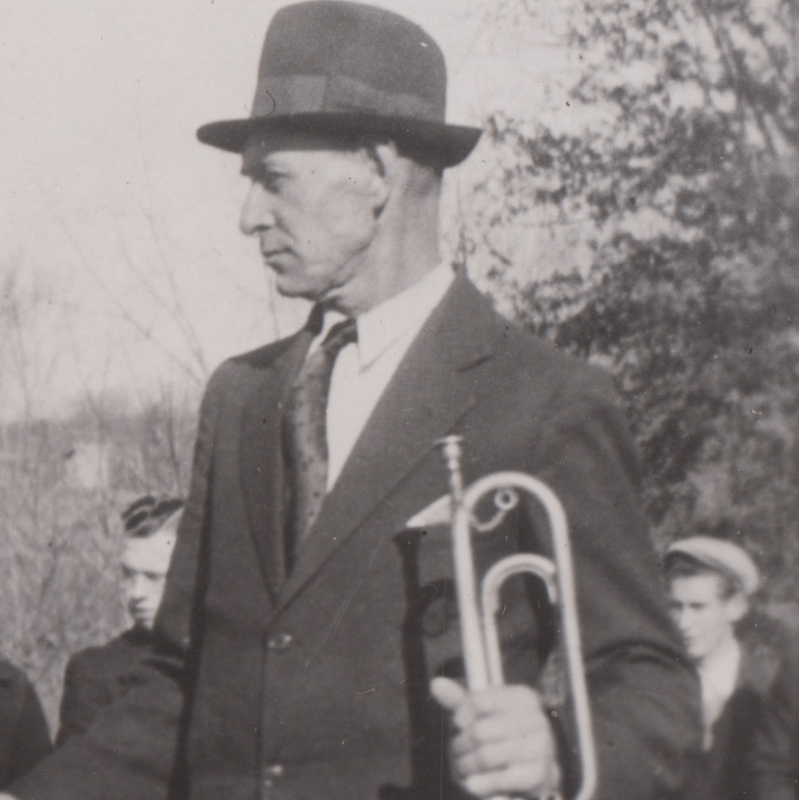 In 1922 Hughes purchased a bugle from Sears and Roebuck for $2.98 and taught himself to play. He thought blowing a bugle would be a healthful exercise. 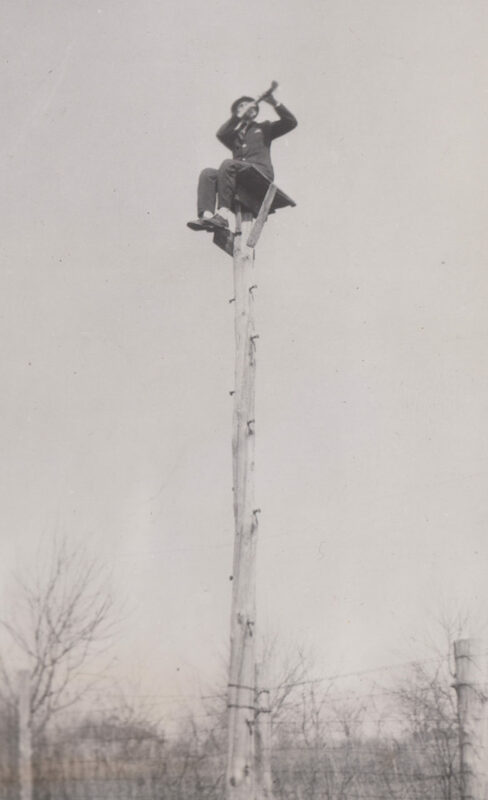 At sun-up on March 15, 1924 Hughes climbed on pole he built in his yard and sounded Reveille. He was to repeat this performance every day for the next 36 years. Despite the weather, he was up early around 4:30 to play except for the times he was either on vacation or traveling because of his fame. 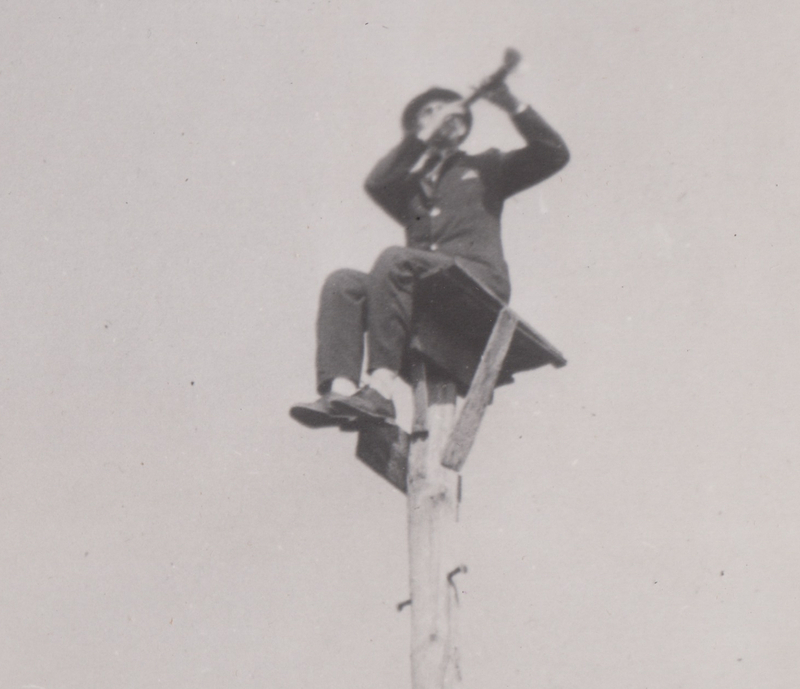 Some locals claimed that Hughes had money buried by his pole that he checked on each morning before climbing up to sound the morning call. 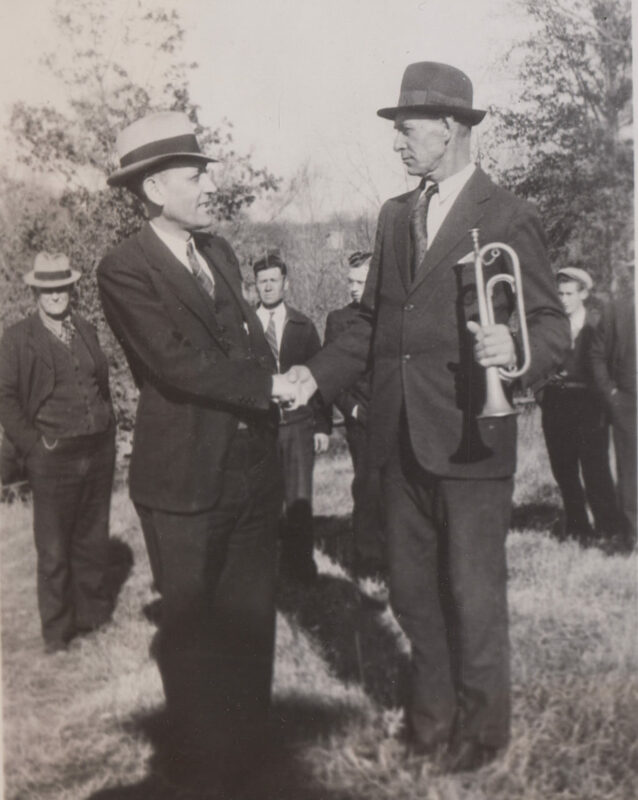 In March, 1938, the town led by Mayor Will T. Sewell turned out to honor him on the 15th anniversary of his playing each morning. Hughes worked as a post-office messenger. He never married, first living with his mother and then with his sister, Ava, when he retired at age 65. A concession he made to retirement was moving his wake-up to 6 am and adding a bell he would also clang if he couldn’t blow the horn. Despite his bachelorhood, he said he was still looking. A woman from Virginia had proposed marriage if he would come to her farm and blow the bugle for her. He said he was too busy to take her up on it. In December 1961, he gave up playing the bugle telling a newspaper that he had lost too many teeth to play all the right notes. He passed away on August 12, 1970 of heart failure. So that is some record. Let’s see if someone can top that! This entry was posted on Friday, April 22nd, 2016 at 10:47 pm	and is filed under Bugle Stories, Buglers Through History, General Interest, Getting Started on the Bugle, History of Taps, History of the Bugle, News. You can follow any responses to this entry through the RSS 2.0 feed. You can leave a response, or trackback from your own site.